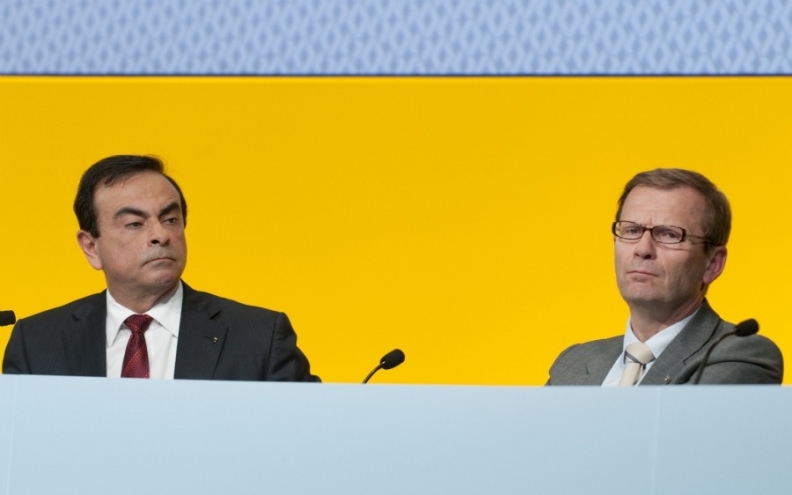 Ghosn and Pelata perfected their complementary roles at Renault over many years of cooperation, with Ghosn handling strategy and Pelata implementation. PARIS -- The departure of Renault's number two executive, Patrick Pelata, over a spying-turned-fraud debacle heaps pressure on CEO Carlos Ghosn at a crucial moment in the carmaker's latest strategic initiative. Pelata resigned as chief operating officer on Monday, taking the flak for an embarrassing fiasco in which Renault fired three employees suspected of leaking information on electric vehicles who turned out to have done nothing wrong. Pelata's departure as COO safeguards Ghosn's high profile role as head of both Renault and Nissan. But the void left by the exit of a trusted lieutenant cranks up the pressure on Ghosn, a dynamic figure who has been feted for his dramatic turnaround of Nissan but who is struggling to impress Renault investors. The management turnabout also highlights the scale of state involvement in decision-making at Renault, whose biggest shareholder is the French government with a 15 percent stake, and raises doubts about how it is run. The French carmaker's long-awaited new six-year strategic plan, revealed in February, disappointed investors who were hoping for concrete steps to revamp the financial structure of the 12-year alliance and squeeze more value from it. The implementation of the plan -- which prioritizes international growth in a bid to boost profitability -- will be key if Ghosn wants to win kudos from shareholders. Renault is also taking a big gamble as it readies the launch of the first of the electric cars it hopes will make it a mass-market leader in the burgeoning technology later this year. Ghosn will now face those challenges without his key ally. And while Pelata will not leave his current role immediately and will stay with the Renault-Nissan alliance, it is not obvious who will fill the void he leaves when he does step dowfrom running Renault's day-to-day affairs. "The Ghosn-Pelata double-act has worked well until now ... so it could be difficult to quickly find a replacement, which is a real problem," CM-CIC analysts wrote in a research note. Ghosn and Pelata met at university and had perfected their complementary roles over many years of cooperation, with Ghosn handling strategy and Pelata implementation. "Without Pelata at the helm, this plan could be disrupted, even delayed by six months to a year," wrote the CM-CIC analysts. The clumsy handling of the affair and its consequences also raises questions about Renault's management. Pelata had long been seen as the likely candidate to take the fall for the debacle, and he initially tendered his resignation in March, when Renault admitted it had been tricked, apologised to the three executives it wrongly fired and said it would compensate and offer to reinstate them. Ghosn refused to accept Pelata's departure at the time, saying he "didn't want to add one crisis to another." Instead, he and Pelata pledged to forgo their 2010 bonuses and profits from 2011 stock options. On Monday, in a dramatic U-turn, Pelata quit, in a move that exemplifies the weight of state influence in Renault's decision-making. "This decision seems symptomatic of the group's management methods and of the involvement of the state in the group's internal affairs," the CM-CIC analysts wrote. "The state never called for Carlos Ghosn's head," government spokesman Francois Baroin told RTL radio on Tuesday. "On the other hand, we wanted there to be sanctions. There were investigations, the chain of responsibility was determined, measures have been taken and we take note of them," he added.